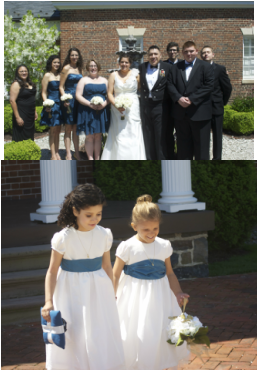 Overall, our wedding was beautiful. We had a few teeny hiccups and one major-our chaplain didn't show up, his cousin had to step in and perform a ceremony on the fly, that wasn't legal. (Our chaplain showed up later, apparently he "lost track of time"- WTF? !, we were pissed but we had him make our marriage legal in the hallway, while our oblivious guests enjoyed salmon and filet mignon.) It was a good time, but weddings are exhausting. We skipped the honeymoon to spend time with the fam before our big move to Nebraska, where we are currently settling in. If anyone has any questions or is interested in purchasing any of our decor items, hit me up on the contacts page. 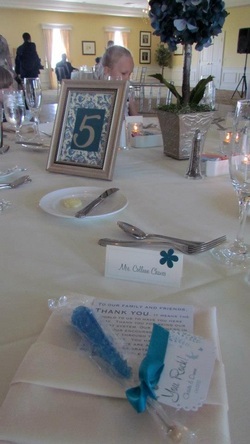 Table numbers, topiaries, placecards, TY cards, and favors were all DIY. 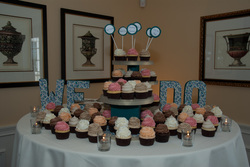 Cakestands, sign and flavor markers were all DIY.